We have a problem in this country, sudden cardiac arrest. Approximately 450,000 people die each year from sudden cardiac arrest (SCA) in the United States. It can happen to anybody, anywhere, anytime and without any warning, so helping a person suffering from cardiac arrest is all about what you do immediately following the persons collapse. The best “save” rates have been reported when using an automated external defibrillator or AED to deliver an electric shock or defibrillation within three minutes of the patient’s collapse. Early defibrillation in conjunction with C.P.R has been found to be the only definitive treatment for sudden cardiac arrest. For every minute that a person in cardiac arrest goes without being successfully treated by defibrillation the chance of survival decreases by 7 percent per minute in the first minutes, and decreases by 10 percent per minute as time advances beyond 3 minutes, so starting life saving measures such as CPR and using the AED as soon as it arrives it essential. 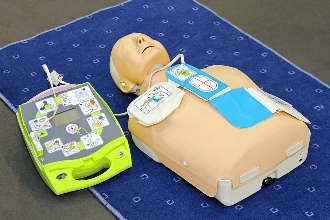 With time being of the essence and the average response time for emergency services being 10 to 12 minutes (which may not be fast enough for a patient because after approximately three to five minutes irreversible brain damage may begin to occur if there is no defibrillation), having access to an AED and knowing how to use it is very important. So how do you use an Automated External Defibrillator? As we said before, AED’s are very user friendly and speak in plain English and will walk you through the entire process, even reminding you to call for help if you haven’t already done so. In the basic life support class we have a pneumonic that helps people remember the 4 basic steps to using an AED: P.A.A.S. This stands for Power, Attach, Analyze, and Shock. Power: Most AED’s turn on when open but some may have a power button. Attach stands for attaching the defibrillator pads to the chest of the patient to match the pictures that are provided on the pads. Shock means to manually press the shock button and shock the patient if and when the machine says it’s time to do so. Now as we said before, having the proper training will make this whole process much smoother but is not a requirement. I would however recommend it. Where to find an AED? AED’s either held by trained personnel who will attend events or are public access units which can be found in places including corporate and government offices, shopping centers, airports, airplanes, restaurants , casinos, hotels, sports stadiums, schools, and universities, community centers, fitness centers, health clubs, theme parks, workplaces and any other location where people may congregate. In many areas, emergency vehicles are likely to carry AEDs, with some units carrying an AED in addition to manual defibrillators. Some areas even have dedicated community first responders, who are volunteers tasked with keeping an AED and taking it to any victims in their area. AEDs are also increasingly common on commercial airliners, cruise ships, and other transportation facilities and with advances in technology and policy requiring AED’s to be placed in more and more places AED’s are becoming more accessible as well as more affordable. Automated External Defibrillators are truly miracle machines and are changing people’s lives for the better and I hope this article has given you a basic understanding of how to use one should the time come. I encourage everyone to take a certified AED instruction course and really become familiar with these machines and the process involved in using them because you never know when you could be called to action and as we said before, there is nothing better you can do in a cardiac arrest situation than using an AED. Thank you and Have a Safe and Happy Holiday Season. Personal WaterCraft & Kids: How to Make Them Fun AND Safe! Posting to my Facebook and Leslie Loves Veggies Facebook Fan Page! Thank you! AEDs can save adults’ lives too! There should be AEDs in every school, I think. I agree 100 % that there should be an AED in every school and that AED’s can save adults lives too. The reality of AED’s in schools is that AED’s cost money and as i had mentioned, there are people who feel like we do and have gone ahead and raised to money necessary to purchase one. Hopefully one day very soon states and cities will find it in their budgets and do the right thing and budget in the purchase of AED’s for each school. As for AED’s saving adult lives, the overwhelming majority of AED uses are on adults and have absolutely been proven to save lives in both children and adults. The American Heart Association has recently changed its guidelines to include AED’s for infants so now Everyone is included in the AED guidelines and you can use the Adult pads that come in every AED on children and infants if need be as well.